Calabar Bean (Physostigma Venenosum) other names: Chop Nut, Esere Nut, Faba Calabarica, Fève de Calabar, Haba de Calabar, Haricot de l’Ordalie, Legume, Ordeal Bean, Physostigma, Physostigma venenosum. The plant known as the calabar bean is a woody climbing perennial plant. The calabar has a twining vine that can reach lengths of fifty feet or more in some plants. Calabar bears leaves in clusters of three; the leaves are pinnate and quite large in size. The calabar bears purple colored flowers when in bloom. The dark brown fruit pods each have two to three brownish black colored seeds, these are kidney shaped and each bean is approximately an inch in length. There is a thin and fine line dividing a deadly poison and a beneficial medication in most cases. The nature of this thin line between a poison and a medicine can be illustrated with absolute clarity by the fruits borne on the twining woody vine of the calabar, an herb which is so named because it is indigenous to an area of Africa formerly known as the calabar region. The habit of the calabar vine is to root itself along the river banks, from this rooting spot, the plant reaches out its climbing stems and climbs fifty to sixty feet high into tallest trees in the forest. The calabar bears long clusters of big purple flowers from the vine and these hang in spring like bloated wisteria blossoms in the forest foliage. These flowers fall away in time and the ovules develop into six inches long, brownish yellow colored seedpods. These ripen on the vine and split, to reveal about two or three fat maroon colored seeds known as the calabar beans to locals. The people of the former calabar region of Africa once made great use of the calabar vine until the last century or so, in fact, the calabar bean was used by the natives of the area as a type of botanical judge, as a jury, and even as an executioner in shamanic trials. For example, a person who was accused of a serious offence would be forced to consume an herbal drink made from the grounded calabar beans. The person would be presumed innocent if he or she regurgitated the deadly decoction. However, if the drink killed him or her, the person was believed to have been guilty of the crime and thought to have deserved that fate. This rather harsh judgment using the beans was a simple and direct system of tribal justice practiced by the calabar natives, however, the judgmental rite was stopped due to the disapproval of the British eventually colonized the region. The British eventually banned the cultivation of calabar beans as a means to end the practice of trial by ordeal. However, calabar vines still grew in the wild, and as a result, the initial measures at banning cultivation had little effect on the trial system. The practice was outlawed by the British in the mid-19th century and strict measures were enforced to put an end to the trials. This resulted in the discontinuation of the practice by the turn of the century. The reason for the potency of the calabar beans remained unknown for a long time. Once the beans were chemically analyzed, it was found to possess several alkaloids, the principal one was the alkaloid called physostigmine, and this compound is a powerful stimulant for the contraction of muscles. This alkaloid can cause death inducing rapid contraction in the muscles of the heart, contraction in the diaphragm, and contraction in the pulmonary muscles to the point that rigid paralysis sets in and the person dies. This unique ability of the alkaloid has resulted in its application as a medication for reversing the action of different poisonous sedative substances such as atropine and curare - these sedative compounds bring death by relaxing the same muscles that physostigmine affects. Clinical researchers studied the property of this alkaloid, and as a result medical doctors have also begun to employ physostigmine and its synthetic analog - neostigmine, to help stimulate the intestinal muscles to offset the shock of surgery and to reverse the symptoms of the severe muscle weakening disease myasthenia gravis - which affects the face. Calabar bean extracts are used primarily in the field of ophthalmology, where the herbal extract is very useful due to the presence of alkaloids. The alkaloids in the calabar bean are miotic, and contract the pupil in the eye. In disease such as glaucoma, this effect of the alkaloids helps to reverse the accumulation of fluid pressure within the eye ball - a situation that can lead to blindness if left untreated. The name of the calabar bean is derived from the western region of Africa, in the area around present Nigeria once known as the Calabar, the vine is indigenous to this region. At the present time, cultivation of the calabar bean is undertaken in parts of South America and in countries like India. Calabar bean is a plant. The seed of calabar bean is extremely poisonous and is also used to make medicine. 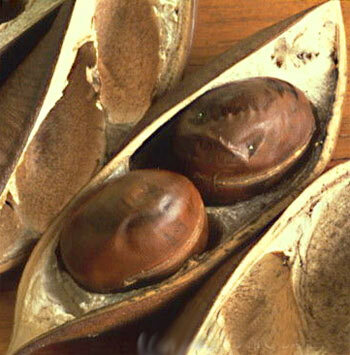 The calabar bean has a notorious reputation in the African continent. Calabar beans which poisonous were at one time the traditional "ordeal poison" of native tribes. The toxic beans were employed in identifying a “witch” or a person possessed by evil spirits as well as in identifying criminals. When a person was accused of a crime, he or she would be forced to ingest several of the calabar beans, the accused would then be observed and proclaimed innocent if he or she regurgitated the beans and managed to survive the ordeal - this was a very barbaric ritual. Though considered barbaric and illegal in all of Africa, the trail by calabar bean is still being practiced in the tribal rituals of some tribes living in remote areas. Calabar beans contain many alkaloids and other compounds, some chemicals extracted from the bean have been employed in the manufacture of agricultural insecticides and extracts have also been used in nerve gases used in chemical warfare. The primary toxic compound found in the calabar bean is the alkaloid called physostigmine. This compound helps in prolonging the activity of the primary neurotransmitter in the brain - acetylcholine, this important neurotransmitter is responsible for the stimulation of the secretions in the gastric tissues, and it is responsible for the contraction of smooth muscles, and aids in the dilation of blood vessels as well. The alkaloid helps prevent damage to the optic nerve and prevents loss of vision symptomatic of the dangerous disease known as glaucoma. The alkaloid extract is also employed in countering toxicity in the central nervous system caused by anti-cholinergic medications. The alkaloid is also used to stimulate the intestinal tract. Alkaloids in the calabar bean are being researched to find out if they can be used in treating Alzheimer's disease and related brain disorders. When forty five children in Britain were accidentally poisoned by eating calabar bean, the most prominent physical symptoms in the children noticed in the hospital were the complete loss of all mobility, extreme prostration, the children showed retarded and feebleness of pulse, they perspired profusely, they suffered from persistent coldness in the extremities, they experienced bouts of vomiting, and some of them came down with severe diarrhea that lasted from days on end. One of the poisoned children who neither suffered from nausea nor vomited subsequently died as a result of the toxic beans. Most of the physical symptoms that affected the majority of the children, took only six to seven hours to disappear. Opinions differ on the type of symptoms induced by the calabar bean, as some think of it as a respiratory poison that causing asphyxia, while there are others, who think it interferes mainly with the contractions of the heart muscles and produces syncope in the body. Another property of the calabar bean seems to be its role as a spinal paralyzer that can lessen the excitability of the peripheral extremities in the motor nerves of the body, thus causing degradation in the excitability of the muscles, and directly slowing down reflex actions in the body. The initial action of the alkaloids in the calabar bean is to contract the blood vessels and the second affect leads to their dilation. The alkaloids in the calabar bean lowered the pulsation rate of the cardiac muscles. Due to the sphincter contraction effect brought on by the alkaloids in the plant, a person who ingests the beans may suffer from retention of the urine. As medicine, Calabar bean is used for eye problems, constipation, epilepsy, cholera, and tetanus. Calabar bean is unsafe. Calabar bean is extremely toxic. Calabar bean can cause excessive saliva and sweating, reduced eye pupil size, nausea, vomiting, diarrhea, irregular heartbeat, blood pressure changes, confusion, seizures, coma, severe muscle weakness, paralysis, severe breathing problems, and death. You have heart disease or slow heartbeat. You have poor blood circulation leading to tissue death (gangrene). You have blockage of the intestinal tract.